On 7 July we had a special treat when Susie Fisher arrived from London. We were pleased and flattered that Susie had decided to allocate almost a third of her three month sabbatical to time aboard ADAGIO. To meet up with us in New Caledonia she had to fly more than half way around the planet via San Francisco and Auckland to Nouméa — while carrying 22 kg of duffle, most of which was goodies for ADAGIO. Susie’s first experience aboard ADAGIO was 2014, when on Eva Menuhin’s recommendation she had joined us in Nouméa for our 2014 passage to New Zealand. We gave her one night of jet-lag recovery in her Nouméa hotel, then bicycled off with her passport to process ADAGIO through the New Caledonia exit formalities. In two hours we had our outbound clearance for New Zealand. Next we made a safety stop at Ile des Pins for a much-too-brief exposure to our favorite piece of tropical paradise. 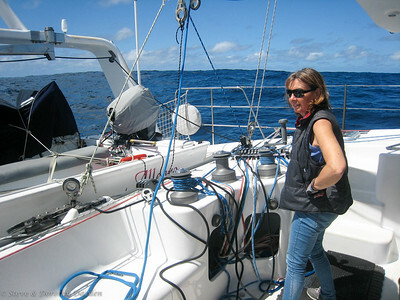 Then Susie ‘enjoyed’ a mostly upwind passage to New Zealand. This was an unusual upwind passage for ADAGIO as we agree that “Ladies and Gentlemen never sail to windward”. But, to make it a memorable voyage for Susie we decided to break some things — like our biggest 130mm mainsheet block — so Susie could participate in the jury-rigging. Susie absorbed all that passage punishment with great cheer. Oh, almost forgot, half-way to NZ we discovered that Susie’s hatch was leaking. This is the hatch right over her double berth! She had been silently and stoically coping with squirts of seawater from the seas crashing over the foredeck. Once we had ADAGIO under maintenance in NZ we deduced that we must have distorted Susie’s hatch frame by catching a sheet under the corner of the hatch lens. To ensure against similar future leaks we replaced the entire hatch frame. After making landfall in New Zealand, and as our collective reward for the upwind passage we enjoyed a splendid couple of weeks together exploring the Bay of Islands. With that introduction perhaps you can see why we consider Susie to be such a fine shipmate. 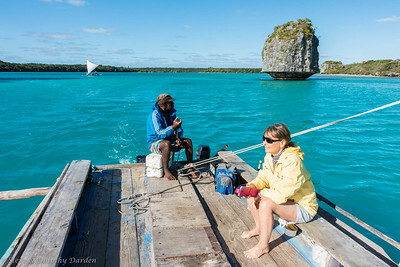 The weather remained calm throughout her visit, giving us perfect weather and sea conditions for visiting numerous islands and reefs in the New Caledonia Southern Lagoon, where the reefs are relatively untouched. Susie is a strong swimmer, a good dive buddy for Dorothy, and as this was her first introduction to coral reefs, she was really excited. 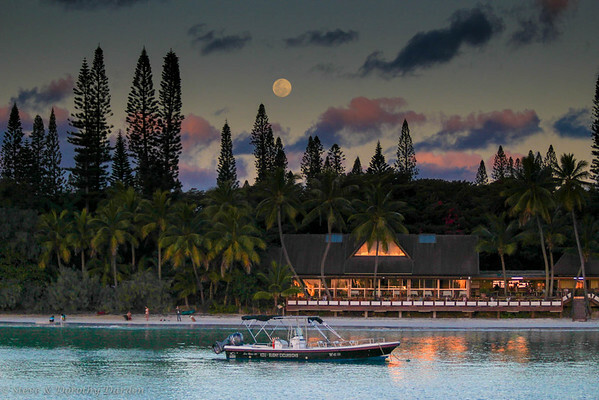 Sunset and moonrise over Kuto Bay, click for gallery. 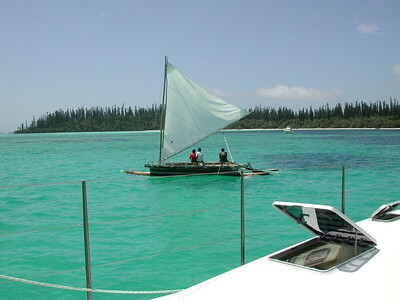 Kuto Bay: We wanted to ensure that Susie could enjoy what we think is the very best of New Caledonia. So when the wind shifted to the north on June 29th we scampered straight to Baie de Kuto, the prime anchorage of Ile des Pins. Our plan was that Susie could avoid being stuck in Nouméa for a week or more waiting for weather. Turboprop aircraft go to weather very effectively! A few days at anchor in Kuto Bay enabled Susie to recover from jet lag. We visited the village of Vao and shopped for fresh produce at the farmers’ market. A kind gentleman opened a fresh coconut for Susie by banging it on a large rock to break it open, then removing the flesh with a large knife. We spent quality time with our friends Cleo, Albert, Brigitte and Tony, who own the two very special boutiques at Kuto Bay. 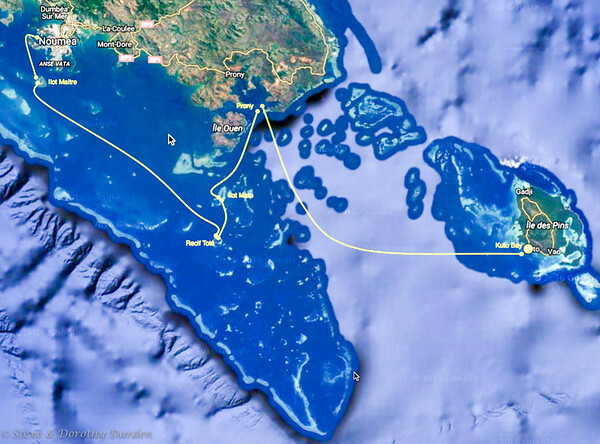 Our circumnavigation of Isle des Pins: Kuto to Oro Bay, Oro Bay to Gadji Bay to Ouameo, Ouameo to Kuto Bay. Click to embiggen! Baie of Oro: We are always looking for the right weather opportunity to move ADAGIO to another of our preferred options. On July 9th with the wind shifting from strong southeast to lighter southwesterlies we decided to sail counterclockwise around the islands to the beautiful Baie de Oro on the NE corner of the island. Outrigger sailing alongside ADAGIO in Oro Bay on our first visit. Click for the Oro 2000 gallery. One objective for our visit to Oro Bay was to indulge ourselves in a crayfish dinner at the modest but locally famous Kou-Gny Restaurant on the beach of Oro Bay not far from the five-star Le Meridien Resort. We discussed the availability of our cray dinner with the restaurant for three days – but there just weren’t any crays wanting to be eaten that week. Another objective was to checkout the snorkeling options — which turned out to be a bit of a disappointment. Perhaps because we weren’t keen to get too exposed to the enormous seas crashing over the reefs – the reefs that were the only thing protecting us from waves that could have originated in Chilé. Bay of Gadji: So next we sailed over the top of IPD through the Passe de Upe into Bay of Gadji. We needed the sun to be high to eyeball navigate our way through the reefs and bommies, which meant the tide was too low for us to sneak ADAGIO into the northern anchorage near Ile Nene. So we chose a safe anchorage on the east side of Ile Menore in 3 meters. There was too much wind to anchor our tender up next to the outer reef where we understand is the best snorkeling. 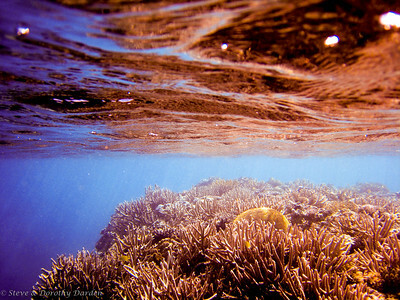 So we settled for a snorkel exploration amongst the Ilot Tianoa bommies. Recif Numae. Click for gallery..
Bay of Ouameo: We continued around to the western side of IDP to the Bay of Ouameo. We anchored ADAGIO on the lee side of Reef Numae, where Susie and Dorothy found Beautiful! Coral! Dorothy’s underwater camera found many good subjects, including a beautiful, placid, Nurse Shark. Its profile is different from the Black-tipped Reef Shark and the White-tipped Reef Shark that we had seen elsewhere. 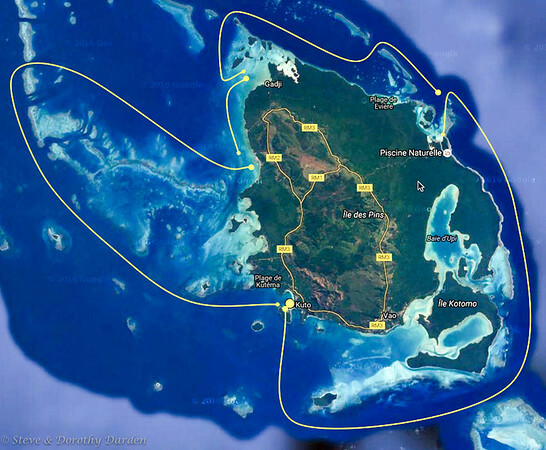 Kuto Bay again: On July 17th we appraised the coming wind outlook, deciding we should complete our circle back to Kuto before it becomes really uncomfortable to make our way south down the outside of the barrier reef, the Passe de la Sarcalle side of the Ile des Pins western lagoon. We returned to Kuto Bay at IDP, where we saw many Green Sea Turtles, and even a Dugong. 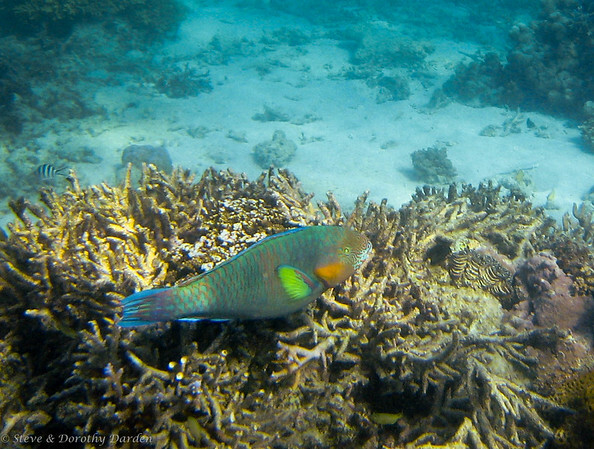 We found some of our best snorkeling at beautiful Kanumera Bay adjacent to Kuto Bay, where the fish are very accessible and unafraid. Baie de Upi: Susie just enjoying leaving the driving to Momo. Click for gallery. Outrigger Sailing on Upi Bay: One last “must-do” for Susie was a cruise aboard a traditional outrigger sailing canoe in Upi Bay, which is the exclusive preserve of the local Kunie people. Our captain, Momo, had built his craft 31 years ago out of native timber, primarily the columnaris pine tree. The cruise departed from St-Joseph Bay on the east side of the Isle of Pines. We sailed through a shallow, sandy pass, and out onto the broad, shallow bay. Several other outrigger piroques accompanied us, providing photo opportunities with the forests of columnaris pines, ancient coral mushroom islands, and the local mountain, Pic Nga, in the background. 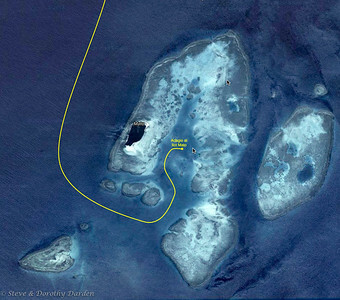 Islands and Reefs in the Southern Lagoon: our route from IDP, click for gallery. From the Isle of Pines we sailed to Ilot Mato, a horse shoe-shaped reef with a lovely uninhabited island at its apex. Four Ospreys soared noisily above the small island. 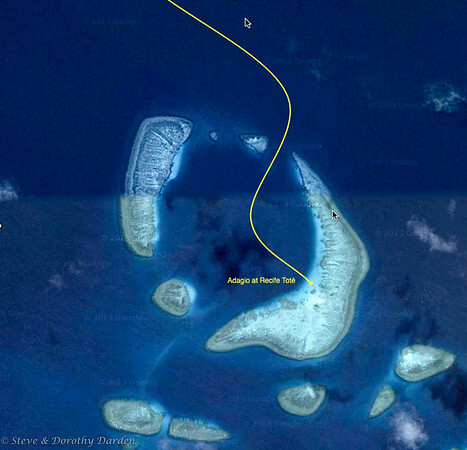 We used our inflatable kayak to travel between ADAGIO and the reefs and island, and anchored it while we snorkeled. During the evenings, Steve took photographs of the full moon, with remarkable results – especially having been taken from a moving boat. 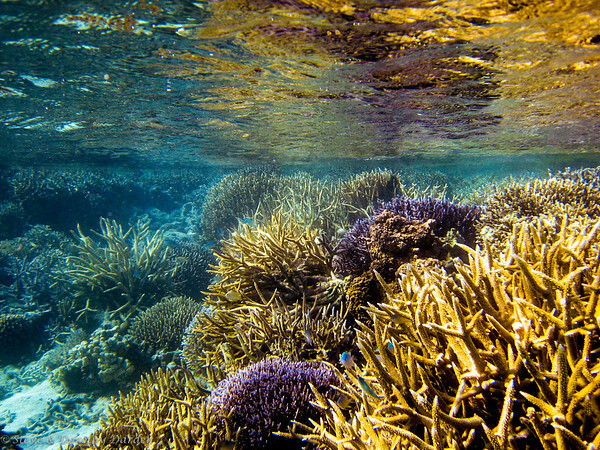 Susie and Dorothy dived twice on the Ilot Mato reef community, a beautiful collection of corals and fish. Next, Recif Tote’, where at high tide, all you can see is the horizon. Ilot Maitre: On the way back to Noumea, we stopped at Ilot Maitre, which is a marine reserve, and teeming with a high diversity of tropical fish. The resort is welcoming to cruisers, and the walk around the island rewarded us with beautiful water views, large spiders in the trees overhead, but surprisingly few Tricot raye snakes. Susie caught the flight from New Caledonia to Auckland, then to London, on 28 July. She made us happy to share with her the sort of adventuring that we designed ADAGIO to do. We continue to revel in ADAGIO’s abundant water supply, comfort, ease of sailing and motoring, spacious accommodations, cooking facilities, 360 degree views, well-designed cockpit for relaxing and running the boat, spacious decks and many safety features. This entry was posted in 2016 Cruises by Steve Darden. Bookmark the permalink.